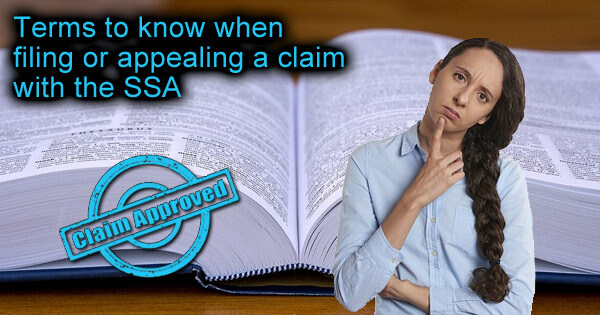 Terms used by the SSA when processing disability claims. Filing for a disability claim with the Social Security Administration involves navigating a sea of unfamiliar terms and abbreviations anyone could find confusing. Most people will catch on to this new language quickly, but it is always helpful to have a quick reference or “cheat sheet” handy when reading through instructions and forms. The following explanations of common terms and abbreviations is meant to be used as a resource and assist you in the process of filing a claim with the Social Security Administration. Filing a disability claim with the SSA involves navigating a sea of unfamiliar terms and abbreviations. It is always helpful to have a quick reference or “cheat sheet” handy when reading through instructions and forms. SSDI – Social Security Disability Income. A federal entitlement program that is usually available to any person who has paid into the Social Security system for at least ten years, regardless of current income and assets. SSI – Supplemental Security Income. A federal program designed to meet the basic needs of elderly, blind and disabled individuals who would otherwise have a hard time paying for food and shelter. It has a very strict set of financial requirements. When a person applies for both SSDI and SSI benefits at the same time it is called a concurrent claim. This may happen when a person receives a low monthly SSDI payment because their wages were low or they did not work much in recent years. To qualify for an SSI payment in addition to an SSDI payment, unearned SSDI must be less than $750 per month. SGA – Substantial Gainful Activity. Work that brings in over a certain dollar amount per month. In 2018, that amount is $1,180 for non-blind disabled applicants, and $1,970 for blind applicants. PRW	– Past Relevant Work. Work that an applicant has done within the past 15 years, that met the requirements of substantial gainful activity, and lasted long enough for the applicant to learn how to perform the work. AOD	– Alleged Onset Date. The date an applicant claims their disability began. Since the onset date may have been before an applicant files a claim, the disability onset date determines how much in past due benefits, or backpay, an applicant may receive. The onset date may also determine if a claim is approved, since an applicant must be disabled for 12 months, or expected to be disabled for 12 months, to qualify for disability benefits. The date of onset marks the beginning of the 12-month durational requirement. DLI – Date Last Insured. The date applicant last met the non-medical (i.e. income) requirements for SSDI benefits and is the last date an applicant is eligible to qualify for Social Security Disability Insurance (SSDI). An applicant’s DLI depends on when they last worked. PFD	– Protective Filing Date. The date an applicant contacts the Social Security Administration and indicates an intention to file an application for SSDI or SSI. This date is used to determine when an individual can begin receiving SSI benefits. Payments made to an individual for the months between the date they applied for disability benefits and the date they were approved for benefits. Disability applications take a long time to process; there is usually a delay between the application date and the approval date. There is also a 5-month waiting period for Social Security Disability Income so an individual is only eligible to receive back pay for any delay beyond the wait period. Individuals receiving SSDI benefits are eligible to receive retroactive benefits which are benefits paid for the months between the time an applicant becomes disabled and when they applied for disability benefits. These are benefits an individual would have received if they had applied for benefits earlier. POMS – Program Operations Manual System. A primary source of information used by Social Security employees to process claims for Social Security benefits. This document was created for Social Security Administration employees, but the public version of POMS is identical to that version. HALLEX	– Hearings, Appeals and Litigation Law Manual. A publication from the Social Security Administration’s Office of Disability Adjudication and Review (ODAR) that provides guidelines regarding how Administrative Law Judges and other Social Security Disability adjudicators should handle various aspects of the Social Security Disability appeals process. DOT – Dictionary of Occupational Titles. A national standardized job database to document the physical requirements of an occupation. Social Security will compare an applicant’s condition to DOT entries of their current and previous jobs to see if they are qualified for work. Unfortunately, the DOT (which hasn’t been updated since the late 1990’s) does not address certain aspects of most forms of work, such as mental and emotional strain. Social Security is currently working on a replacement for this system, called the Occupational Information System (OIS) which the agency expects to implement in 2019. When applicants do not qualify under a medical impairment listing, the SSA will use the grid rules to determine if an individual is disabled. The SSA will consider a person’s education, skill level of their last job, whether any of those skills could be transferred to a new job, and their physical residual functional capacity to determine if an applicant is or is not disabled. RFC	– Residual Functional Capacity. A detailed assessment prepared by the SSA that determines an applicant’s work capability strength-related limitations. RFC is the most an individual can do on a sustained basis. Physical RFC (PRFC) is evaluated in terms of the physical demands of work used in the Dictionary of Occupational Titles and Selected Characteristics of Occupations (SCO). Mental RFC (MRFC) is evaluated in terms of mental demands of work as set out in the Code of Federal Regulations. Sedentary work involves lifting no more than 10 pounds at a time and occasional lifting or carrying objects such as files and small tools. Sedentary jobs involve sitting, but some walking and standing is typically necessary to carry out job duties. Light work involves lifting no more than 20 pounds at a time with frequent lifting or carrying objects weighing up to 10 pounds. A job in this category requires walking or standing, or sitting most of the time with some pushing and pulling of arm or leg controls. If an individual can do light work, the SSA determines that they can also perform sedentary work. Medium work involves lifting no more than 50 pounds at a time with frequent lifting or carrying objects weighing up to 25 pounds. If an individual can do medium work, the SSA determines that they can also perform sedentary and light work. Heavy work involves lifting no more than 100 pounds at a time with frequent lifting or carrying objects weighing up to 50 pounds. If an individual can do heavy work, the SSA determines that he or she can also do medium, light, and sedentary work. Very heavy work involves lifting objects weighing more than 100 pounds at a time with frequent lifting or carrying objects weighing 50 pounds or more. If an individual can do very heavy work, the SSA determines that they can also do heavy, medium, light and sedentary work. The SSA further separates work requirements into occasional, frequent, and constant. Constant work occurs over 66% of the day. DDS – Disability Determination Services. 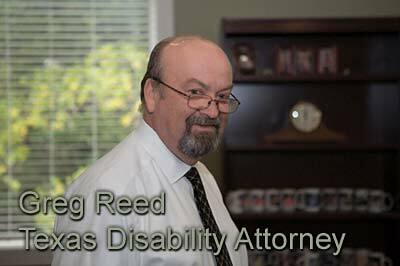 A disability determination requires a team of members to work together in the evaluation of all claims. The team is composed of a Disability Examiner (DE), Medical Consultant (MC) and Psychological Consultant (PC). Not all team members participate in the development and evaluation of all claims, but all team members have training in the disability process. Medical Advisors serve as a medical resource to assist Disability Examiners, Medical Consultants and Psychological Consultants in understanding specialized issues in claims and analyze medical issues related to impairments that they are qualified to evaluate. ALJ	– Administrative Law Judge. Administrative law judges are appointed by and work for the federal government. 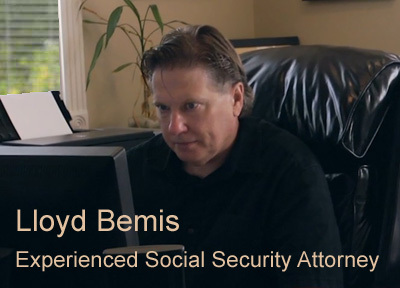 Administrative Law Judges who work for the Social Security Administrative hand down decisions on Social Security disability claims at the hearings level. OTR is short for “on the medical records” and refers to a favorable ruling by an administrative law judge prior to a hearing at the Social Security Administration. An OTR decision is based on written information provided to the judge before a hearing. OTR reviews are available to all individuals who are appealing a denial of disability benefits based on their written application. A vocational expert is an expert witness who is knowledgeable about the current job market and the skills needed to perform specific jobs. The SSA often calls on vocational experts to give their opinion on what jobs they believe an applicant can perform with their limitations. The vocational expert’s role is an important one since their testimony may determine the outcome of a disability hearing.